We know transit takes you to school, work, and everywhere in between. To help make Metro Vancouver’s transit system a little more convenient, we’re introducing Compass wristbands. A wearable Compass Card made of food grade silicone that you wear on your wrist! To gauge public interest in Compass wristbands, we’re doing a limited release of 1,000 adult wristbands and 1,000 concession wristbands starting December 3. Compass wristbands work the same as Compass Card—tap in and out when travelling on transit and reload online, at a Compass Vending Machine, by phone or in person. Hello fellow Metro Vancouverites! Hope it’s goin’ swell for you folks out there. It’s Tuesday, and that means it’s time for #MyTransLink. For our new friends here, #MyTransLink is our series on The Buzzer blog where we publish photos taken and published on social media by you – our customers! You’ve shown us a lot of love by sharing your B.E.A.utiful photos with the hashtag #MyTransLink on Instagram this past week. As you know, #MyTransLink isn’t just about transit in the Metro Vancouver area. It’s about the amazing sights our cities have to offer and, accordingly, our theme this past week is of places in Metro Vancouver that transit takes you to. Read on to check out all the photos selected from last week and the theme for the week to come! Summer is the time to go out and explore new areas, visit family and go out with friends. And what better way to do this than now when we have increased bus service. Our Tap to Pay payment option makes it easier than ever before to pay and be on your way. Remember, Compass cards offer discounted fares if you are a regular transit rider. If the heat is unbearable and you are looking for some FREE options to beat it, worry not. We compiled a list of some cool kid-friendly spray parks in Metro Vancouver that are easily accessible by transit. So, for this week’s #MyTransLink post, we asked you to share photos of transit and the sun! We’ve purposely kept the topic general to see what creative shots you come up with. Perhaps you’ll find a nice shot of the sun reflecting off of a SkyTrain. Maybe you’ll snap a pic of a sun flooded bus exchange or depot. Who knows! [CLOSED] Listen and take this poll to choose the best Morgan Freeman Tap to Pay announcement on transit! In light of information we’ve learned through news stories on May 24, 2018, of serious allegations against actor Morgan Freeman, TransLink has decided to pause his voice announcements as part of a VISA ad campaign on the transit system. We will be reaching out to VISA to discuss further. If you’re of the 35% of poll respondents who opt not to listen to anything while traveling on transit, you’ve likely heard a familiar voice during your commute. In celebration of Tap to Pay launching on May 22, 2018, you will now hear Morgan Freeman welcoming SkyTrain and bus riders into Vancouver by sharing some fun facts, etiquette reminders and a heads up that you can now Tap to Pay with your contactless Visa and Mastercard credit card or Apple Pay, Samsung Pay, and Google Pay at Compass Card readers across the system. Traveling on transit just got easier! Hey Metro Vancouver! As of May 22, 2018, you have more ways to pay for your transit trip! You can now tap your contactless Visa or Mastercard Credit Card along with Apple, Google and Samsung Pay for your adult cash fare to get you from A to B on transit! No more ticket line-ups, finding exact change or worrying about determining how many zones you intend to travel through. Just make sure to tap your intended payment method separate from your wallet to ensure the correct card is charged. 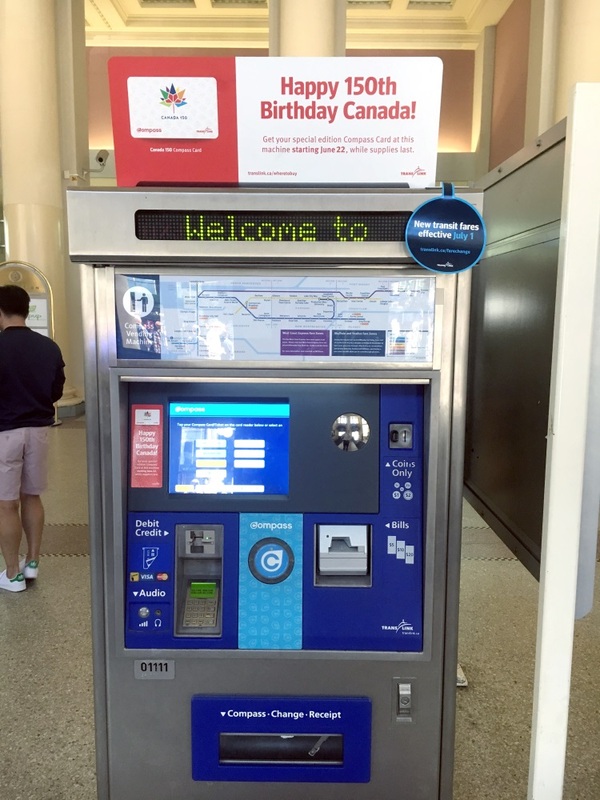 Already love your Compass Card? No worries! Keep using your Compass Card on the system to ensure that you are receiving the maximum discounted fare. Watch our live stream for a full recap of the event. Will you pay with a contactless Visa or Mastercard Credit Card or stick to your Compass Card? #ThanksABillion for one billion Compass taps! It’s time to celebrate!! We are quickly approaching ONE BILLION Compass taps across the system and we want to commemorate this special occasion and to thank YOU, the Compass user, we have an exciting contest where you could win one of ten, special edition #Canada150 Compass Cards loaded with $50 in Stored Value! Contest: Show us your Canada for a chance to win a #Canada150 Commemorative Compass Card! Happy 150th birthday Canada! ?????? Celebrate by getting a limited edition commemorative compass card ?? Hey Metro Vancouver. We LOVE that you LOVE the new, limited edition #Canada150 Compass Cards! In fact, you love them so much that you’ve bought out SIX of 16 Compass Vending Machine locations around the region in just 24 hours! As of July 4, #Canada150 commemorative Compass Cards have sold out. Celebrate Canada’s 150th with a commemorative #Canada150 Compass Card! On July 1, our fair land will be celebrating its sesquicentennial anniversary of Canadian Confederation. That’s just a fancy way of saying Happy 150th Canada! To mark this momentous occasion, TransLink is releasing 20,000 special, limited edition Canada 150 Adult Compass Cards. These cards will be available on June 22 at Compass Vending Machines in select SkyTrain Stations. To find a location nearest you check our interactive map. 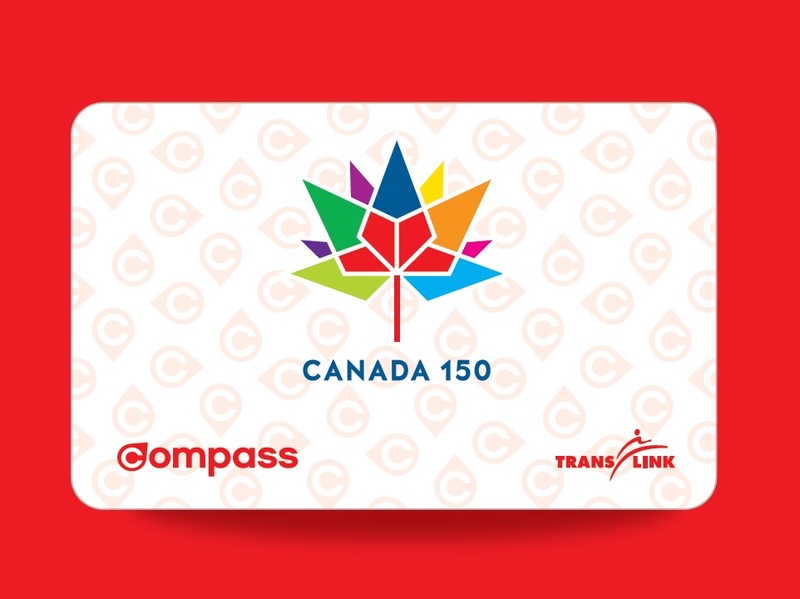 Commemorative Compass Cards will also be available at the Compass Customer Service Centre located at Stadium–Chinatown Station open on Canada Day from 12 p.m. until 6 p.m. while supplies last. Limit one per person. Get yours before they’re gone and celebrate Canada’s 150th by tap, tap, tapping in style! Want to win your way into the celebration? Stay tuned for details on how you can win your very own #Canada150 Commemorative Compass Card! Celebrate Canada Day in person and online! Use the hashtag #Canada150 to share your celebration moments with people across the country! TransLink on the Move is back again with more info unpacked from the 2016 Annual Report. It’s amazing the changes a year can bring! 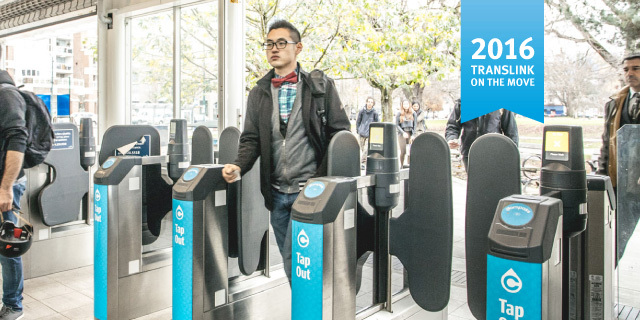 Today, May 8th marks one year and one month since the full closure of all fare gates at SeaBus and SkyTrain Stations across the system. With Compass in full operation we now have 463 fare gates closed, including the recently opened, or rather closed, permanent Compass fare gates at Metrotown Station! In year one, Compass celebrated 1 Million active Compass Cards on the system, as well as full integration into our two secure bike parkades! One card loaded with Stored Value gets transit travel and bike parking all in one! You asked, we listened! Earlier this year, due in part to overwhelming customer demand, we lowered the minimum Stored Value requirement on your Adult Compass Card from $10 to $5, making transit more accessible to more customers. And that’s not all on the Compass front! 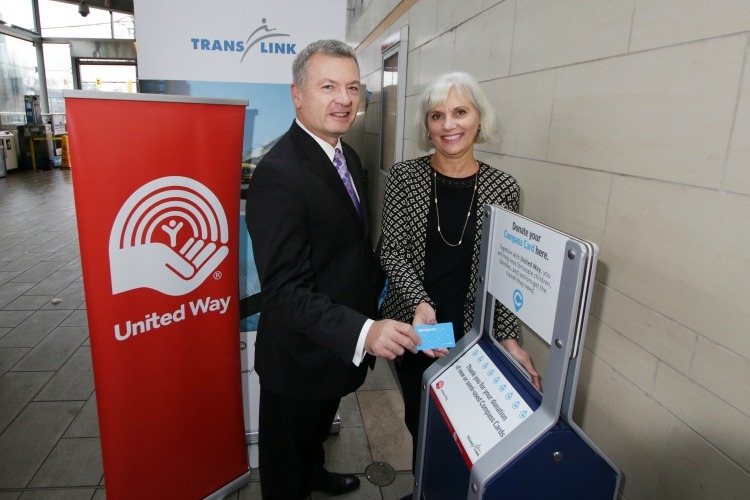 Our recent partnership with United Way Lower Mainland brought five Compass Donation Kiosks to SkyTrain Stations across Vancouver giving customers the ability to donate their unregistered Compass Cards to a great cause. Year one has been chock-full of great Compass News, and we’re excited to see where the future of Compass takes us! March is Fraud Prevention Month and before the month comes to a close, we’re giving you a friendly reminder to register your Compass Card! One of the added benefits of the Compass system is that it’s far safer and more secure than our old paper fare media. When you register your Compass Card online at compasscard.ca, you can to take advantage of AutoLoad, valuable record keeping information such as trip and purchase information and Balance Protection. With Balance Protection, users can report their Compass Cards lost or stolen and any passes or Stored Value will be transferred to a new Compass Card. Additionally, a found registered Compass Card can easily be returned to it’s owner. 750,000 of our 1.1 million Compass Cards are currently registered and we’d love to see that number grow! Register your Compass Card today at CompassCard.ca. Happy mid-March Break! The March 2017 edition of the print Buzzer is now on the system. 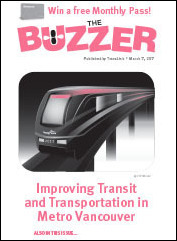 Much of this issue is dedicated to Phase One of the 10-Year Vision for Metro Vancouver Transit and Transportation. We also included what expanded transit services mean to riders just like you with our #MoreTransitMeans Instagram frame photo series. Wondering what to do with an unregistered new or semi-used Compass Card? Donate it to the United Way with our new partnership #Everypasshelps. The card deposit and any Stored Value on the unregistered card will be donated to the United Way to help those in our region. As always, we have our old favourites – Coming Events, Contest Corner and Back Issues. Donate your Compass Card to a great cause! Moving people is what we do, and now through a new initiative with a long standing partner, the United Way Lower Mainland (UWLM), you can help! We hope to install more donation kiosks in the coming months at key locations around Metro Vancouver where customers are likely to tap in to their generosity and support this program and the United Way. Transit plays an important role in helping people live full successful lives, whether it’s going to work, job interviews, healthcare appointments or other activities that enrich their lives. To donate a Compass Card, simply deposit the unregistered Compass Card into your nearest donation kiosk. You can unregister your existing Compass Card by calling Compass Customer Service at 604-398-2042 or by visiting the Compass Customer Walk in Centre. Both the deposit and balance of unregistered Compass Cards will be converted to Compass Tickets for distribution by UWLM to selected agencies working directly with those in need. Compass Stored Value Minimum Load Drops to $5! You’ve asked, and we’ve listened! We’re happy to announce that we have lowered the minimum Stored Value load amount for Adult Compass Cards at Compass Vending Machines (CVM)! Customers can now load Adult Compass Cards at a CVM and select a minimum Stored Value of $5! This change was based on feedback received from you, our customers, requesting a lower minimum Stored Value than the original $10. This change applies only to Stored Value at a Compass Vending Machine. When loading Stored Value online, customers can choose from a number of set options starting at $10, or can choose to “pay balance” to bring a negative balance back up to zero. Minimum Stored Value load amount for Concession Compass Cards remains at $5. For customers wishing to load an amount outside of the set CVM, online or phone parameters, a Compass Customer Service staff member at our walk in centre located at Stadium–Chinatown Station can help. For added convenience, customers add AutoLoad to their Compass Card directly from their bank accounts to automatically renew monthly passes or to top-up Stored Value using this form. Santa is ready to tap his way across the region – just in case! Don’t make Santa’s naughty list – Be sure to tap in and out at all Compass gates! We all know the Santa flies around the world on Christmas Eve in his sleigh with some help from Dasher, Dancer and the rest of the reindeer crew. But what happens if the sleigh malfunctions or the reindeer catch a cold and can’t fly? How ever will Santa get around Metro Vancouver?!? Well, we’ve got you covered, Nick! 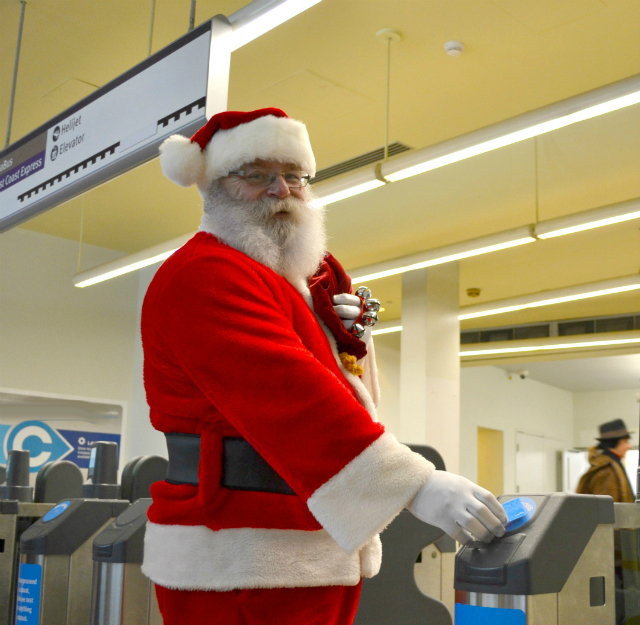 “I am pleased to report that I have spoken with Santa who confirmed that his Compass Card is loaded and ready to use on Christmas Eve. “Santa informed me that in the event of an unfortunate sleigh malfunction, or in case Rudolph or any of the other reindeer need a quick rest during present-delivery duties, he will be depending on TransLink’s convenient public transit network to efficiently deliver presents to children across Metro Vancouver. “Compass Cards facilitate travel on the region’s buses, SkyTrains and SeaBuses as well as the West Coast Express, which is why it is on Santa’s list of “recommended” stocking stuffers. The cards are already popular with Metro Vancouver residents – over one million Compass Cards are in active use by more than one in three people in TransLink’s service area. “I also had the pleasure of speaking with Mrs. Claus who told me that while Santa and his elves have been hard at work this past month making lists and checking them twice, she did hear about the historic opening of the Evergreen extension and has packed a SkyTrain map alongside Santa’s Compass Card to ensure that he can easily navigate the longest, fully automated rapid transit system in the world.